Коллектив авторов - Longman Phrasal Verbs Dictionary » KaZachya.net: Информационно-развлекательный портал. 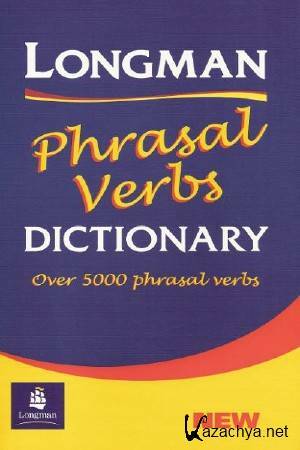 A phrasal verb is a verb that consists of two or three words. Most phrasal verbs consist of two words - the first word is a verb, and the second word is a particle. The particle is either an adverb or a preposition. Examples of common phrasal verbs include get up, go off, turn on, make out, and deal with. There are also some three-word phrasal verbs, for example catch up with, look forward to. An important feature of phrasal verbs is that they are typically idiomatic. Therefore the whole meaning of a phrasal verb cannot be understood by simply putting together the meanings of its individual parts. For example, the meaning of cany out (=do) in the sentence Scientists carried out an experiment is not related to the normal meaning of 'carry' or the meaning of 'out'. Similarly, you could not guess the meaning of pull up (=stop) in the sentence A car pulled up outside the house from the separate meanings of 'pull' and 'up'. A phrasal verb such as answer back (=answer rudely) is related to the meaning of the verb 'answer', but this would not help you to guess the meaning of answer back. Where a verb freely combines with an adverb or preposition to produce an ordinary meaning, this is NOT a phrasal verb. In sentences such as The boy fell off his bike and We carried some chairs out into the garden, 'fall off' and 'carry out' are not phrasal verbs.